Make sure your phone is in search or discoverable mode, then select Continue. HFL automatically searches for a Bluetooth device. Select your phone when it appears on the list. If your phone does not appear, you can select Refresh to search again. If your phone still does not appear, select Phone Not Found and search for Bluetooth devices using your phone. From your phone, search for HandsFreeLink. The system gives you a pairing code on the audio/information screen. Confirm if the pairing code on the screen and your phone match. This may vary by phone. Your Bluetooth-compatible phone must be paired to the system before you can make and receive handsfree calls. Your phone's battery may drain faster when it is paired to the system. If your phone is not ready for pairing or not found by the system within three minutes, the system will time out and return to idle. Once you have paired a phone, you can see it displayed on the screen with one or two icons on the right side. : The phone is compatible with Bluetooth Audio. If there is an active connection to Apple CarPlay, pairing of additional Bluetooth-compatible devices is unavailable and Add Bluetooth Device is grayed out from the Bluetooth Device List screen. Select a phone to connect. HFL disconnects the connected phone and starts searching for another paired phone. Select Connect , Connect , or Connect . If no other phones are found or paired when trying to switch to another phone, HFL will inform you that the original phone is connected again. 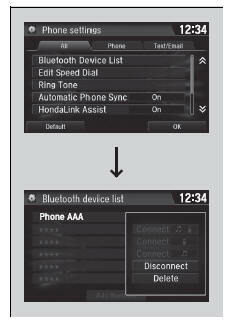 To pair other phones, select Add Bluetooth Device from the Bluetooth device list screen. The default pairing code is 0000 until you change the setting. To create your own, select Fixed, and delete the current code, then enter a new one. For a randomly generated pairing code each time you pair a phone, select Random. Select a phone you want to delete.